The Weaver. In all parts of India the stupidity of the weaver, especially of the Mohammadan weaver (julaha), is the staple subject of proverbial philosophy. His loom being sunk in the ground, is said to dig a pit and fall into it himself. If he has a pot of grain he thinks himself a Raja. He goes out to cut grass when even the crows are ﬂying home to roost. He ﬁnds the hind peg of a plough, and proposes to start farming on the strength of it. 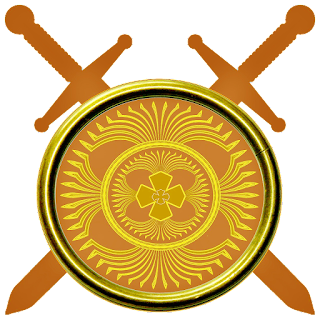 If there are eight Jolahas and nine Huqqas, they ﬁght for the odd one. The julaha goes to see a ram ﬁght and gets butted himself. Being one of a company of twelve who had safely forded a river, he can only ﬁnd eleven, as he forgets to count himself, and straightway goes off to bury himself in the belief that, as he is missing, he must be dead. Some julahas walking across country come to a ﬁeld of linseed looking blue in the moonlight; they wonder how deep the water is and hope that all of them can swim. 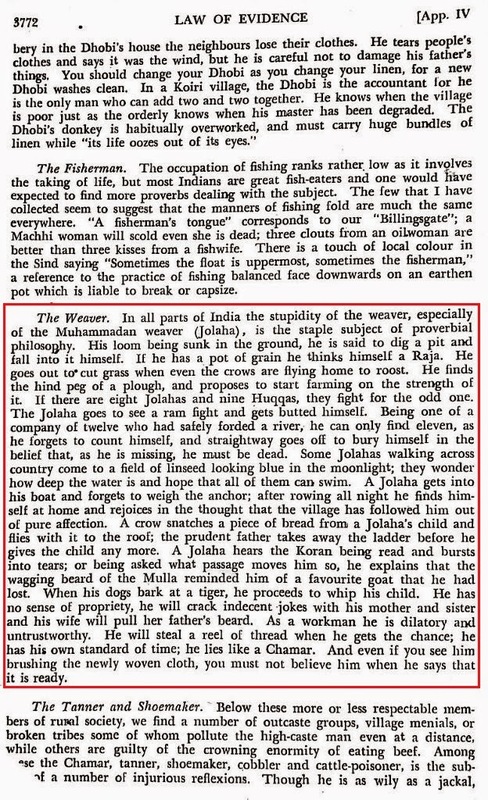 A julaha gets into his boat and forgets to weigh the anchor; after rowing all night he ﬁnds himself at home and rejoices in the thought that the village has followed him out of pure affection. A crow snatches a piece of bread from a ]ulaha‘s child and ﬂies with it to the roof; the prudent father takes away the ladder before he gives the child any more. A julaha hears the Koran being read and bursts into tears; or being asked what passage moves him so, he explains that the wagging beard of the Mulla reminded him of a favorite goat that he had, lost. When his dogs bark at a tiger, he proceeds to whip his child, He has no sense of propriety, he will crack indecent jokes with his mother and sister and his wife will pull her father's beard. As a workman he is dilatory and untrustworthy. He will steal a reel of thread when he gets the chance he has his own standard of time; he lies like a Chamar. And even if you see ‘him brushing the newly woven cloth, you must not believe him when he says that it is ready." ऊपर दिया गया चित्र Law of Evidence (commentary), Woodroffe and Amir Ali की पुस्तक (Appendix-IV, page 3772) का है. यह पुस्तक के एक पुराने संस्करण से लिया गया है. कहते हैं कि अंग्रेज़ जजों को भारतीय जाति समूहों के बारे में कम जानकारी होती थी सो उनकी सहूलियत के लिए ये जानकारियाँ इस रूप में दर्ज करके उपलब्ध कराई जाती थीं. ऐसी जानकारियाँ देने के पीछे कौन सी मानसिकता कार्य कर रही थी इसका अनुमान सहज लगाया जा सकता है. सुना है नए संस्करणों में ऐसा विवरण नहीं है. यदि आपको मिले तो कृपया बताएँ.